Cause du décès: Flying accident at Elsham, Lincolnshire. A number of Commonwealth aircrew are buried in Brigg Cemetery in Lincolnshire. They were training casualties of 15 (P) "Pilots" AFU "Advanced Flying Unit," basedÃ‚Â at Leconfield,Ã‚Â Yorkshire, but using nearby Kirmington facilities. 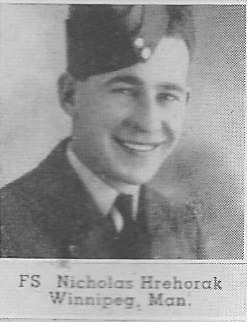 Hrehorak and F/Sgt RL McCulloch RCAF died in a 103 Sqn Halifax during a training accident. He was born in Winnipeg, son of Mr.Mrs. J Hrehorak. Educated at Earl Grey and Kelvin High Schools. In 1932 he won second prize in the Fisher Body Craftsmen's Guild for building a miniature car model, a hobby in which he was expert. After leaving school he worked in Winnipeg as a garage mechanic. Enl. Winnipeg Dec 1940. Trained Boundary Bay and Brandon. Overseas to Scotland and England Aug 1941. Surv. Parents, brothers Paul and George, both RCAF, sisters, Mary, Millie, Olga and Minnie, all of Winnipeg. Aucun article sur Warrant Officer Class II HREHORAK n'a été trouvé dans les médias. Aucun document additionnel sur Warrant Officer Class II HREHORAK n'a été trouvé.